I decided to learn how to make my Halloween cat recipe because Halloween is around the corner. Halloween party cakes are always good to take to gatherings this time of the year. This is one of my special cake recipes which is baked in plain everyday baking pans and then with a few cuts it becomes a Halloween cat. Appropriately, I made it with a devils food cake recipe and frosted it with a rich (devils food) chocolate cream cheese frosting. Learning how to make the Halloween cat recipe was because of the fact that black cats have much folklore surrounding them around the world. In many places the black cat is a symbol of goodness and lots of good fortune and luck. Then in other parts of the world like here in the United States, the black cat has been linked to evilness and witches. The black cat here is linked to many evil superstitions. If a black cat crosses in front of you it is a sign of very bad luck and possibly even death. At no other time of the year is the black cat more demonized than at Halloween so I am adding a little fun (and good taste) with learning how to make my Halloween cat recipe. Halloween is observed every year on October 31. It is a holiday celebrated with costume parties, trick or treating (going from house to house collecting treats), pumpkin carving and visiting many haunted houses. It is a time for telling scary ghost stories and playing tricks on friends. The black cat is seen in decorations with witches all over the country. When I was a child, to me the black cat, witches and ghosts were just pictures. Halloween was all about trick or treating. Sister Shirley (14 years older) would go with me. She didn’t just walk with me; she actually dressed up and went trick or treating with me. She was so much fun! We did not have commercially made costumes like they do today. We wore big clothes and masks. Sometimes we looked like clowns. One year, Shirley wore these big pants and stuffed them with pillows. She was so funny that we laughed the whole night. When we returned home, we were always so cold and tired but we warmed up by searching through all our treats we collected. After I grew up and had my own children. I still liked Halloween. It was never scary or evil. It was a time of ending the hot summer days. It was time to enjoy the Fall smells, a time for bright orange colors and a time to plan fun things for the children. 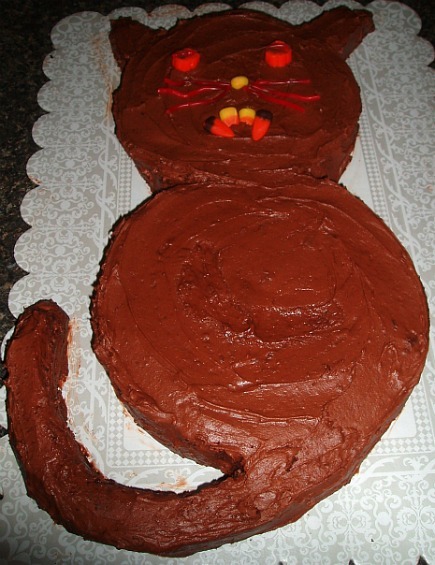 I always liked creating special cake recipes for my children like this Halloween cat recipe. I use to make popcorn balls, bake pumpkin shaped cookies and ice them with orange frosting. I would buy candy and other treats then bag them up to give to all the neighborhood children. It was such a joy to see their faces light up when I handed them a bag of goodies. Combine chocolate with water, heat and stir until chocolate has completely melted. Combine sifted flour and baking soda and sift together. Cream butter with sugar; add eggs beating well after each. Turn beater on low and add melted chocolate; increase speed and blend well. Add flour mixture alternately with sour cream; mix in vanilla. Pour batter evenly into prepared pans; bake about 35 minutes or until pick comes out clean. Remove from oven and cool 10 minutes; remove from cake pans and set until cold. 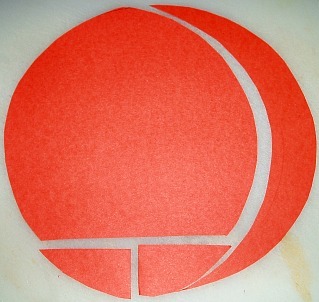 SEE VIDEO to shape cat and to decorate. Melt chocolate in microwave; stir until smooth and cool. Cream butter and cream cheese; blend in cooled chocolate and vanilla. Gradually add in powdered sugar; add enough milk gradually to make a fluffy spreading consistency. Cover cake with frosting and decorate.